In this article, we have come up with the best hospitality job portals from around the globe. This is a list of authority sites which have a reputation for providing best hospitality jobs from over the years. Getting your dream job is a difficult nut to crack in the era of cut-throat competition and rising unemployment rates. Typically, you need to begin the quest by choosing the right portal for the purpose of searching for your ideal hospitality job. Canada Hospitality Jobs are like hot cakes in the hospitality industry along with the opportunities in Top Hospitality Companies in the USA. Same is true for hospitality jobs in the middle east. Whichever might be your desired country of career growth, the key is to keep looking for the right opportunities. 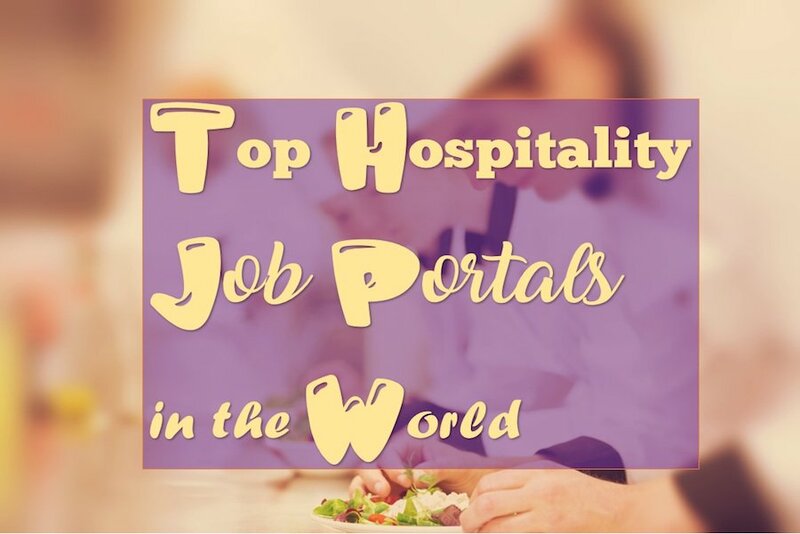 In this article, we are going to share with you 9 best hospitality job portals around the world to help you with the same. Please see the career sites of hotel chains should you wish to apply directly to hotel career portals. However, there are several other good options which cater to hospitality needs and have been found to be trustworthy and reliable over the years. Thus it is important to mix it up using various strategies to stay ahead of the competition while searching for your ideal job. Global Hospitality Portal is a site dedicated to hospitality and working towards aggregation of jobs and hospitality information. Please look at the job search section to look for numerous hospitality job options. Indeed is one of the best career sites as well as the number one hospitality job portal with lots of jobs listings from thousands of companies, newspaper, job brands and other online sources of job postings. Using this website you are able to upload a resume and you will get a personalised resume link to share with employers. If you are a job seeker then you can also find discussion forums and job search tips using this website. This is the biggest job portal on the planet. A lot of Hospitality sites and hotel properties ensure whatever jobs are posted on their sites are backfilled at Indeed. More importantly, it has a global reach for the cosmopolitan hospitality industry. It is one of the biggest job boards, providing job listings, career advice, resume posting and many other resources to the job seeker. Hospitality jobs are not what it is known for but if you are looking for hotel jobs in the US, Canada or even Europe, it would be a wise idea to have an account with Career Builder. Career builder has large local listings because it is the partner with many newspapers. However, career builder has various versions of their site and you need to locate which one is suitable for you depending on your job location preference. As they say, ‘Where hospitality works’. This is one of the most reliable hospitality job portals. This is one of the most reliable sources of hospitality jobs and information related to the hospitality industry. If you are looking for Jobs in North America and Europe, this is probably the best for the hospitality industry. The blog section has decent information and employers have a choice to screen through a rich hospitality database. Making a profile on this site would definitely not do any harm. Hcareers is also expanding towards Asia and other parts of the world looking to cover more grounds in the hospitality industry. It is one of the best career communities and it helps people to find ideal jobs and companies recruit top talent. It has grown to become one of the best hospitality job portals of recent times. The members of the Glass Door are able to see the latest jobs and get access to proprietary user-generated content including salary, interview, review and rating and much more. This is a novel concept where you can keep yourself informed about everything related to your desired hospitality organisation. Jobs are posted directly by employers and thus have higher visibility than a lot of other job boards. It is popularly said, ‘if you are not on Linkedin, you don’t even exist’. This is how Linkedin has gained in popularity. They are becoming the biggest source of jobs and almost all hospitality establishment use Linkedin as a primary source of recruitment. Using this job portal you can identify specific types of opportunities as well as target organisations by following them and staying connected. Socializing meets job hunting at Linkedin. So, start getting connected to land your dream job. Look out for our tips on how to search hospitality jobs through Linkedin. If you want to avoid scams and spams as well as duplicate job listings then Link Up is a great choice for you. This a job aggregation site with jobs posted directly from employers. It is able to monitor lots of company career portions in order to connect job seekers with often unadvertised hospitality jobs. Link up provides all the information about the jobs which are posted on company websites. Monster is one of the best as well as an original jobs board. It has now also included a variety of apps and other resources for job seekers. Monster is available in most of the countries in its local avatars. Monster registered users are able to search for any job and then apply for that job online, review company profiles, post a resume, and get career advice and salary information. Monster also has several value added services at modest prices. Simply Hired another innovative and one of the most popular hospitality job portals around the world and also, it operates the world’s largest job search engine. This jobs portal is able to connect ideal job seekers and employers with the help of its powerful search engine. The search engine of simply hired aggregates jobs from employer’s websites, newspapers as well as various job boards. This is an all hospitality portal. Predominantly based in Europe, this portal is probably the biggest hospitality portal which covers all areas of the industry. Quite similar to this Global Hospitality portal, Caterer is an all hospitality job portal. Job seekers get to access to a database of a million of unique as well as verified positions from worldwide using this jobs portal. Caterer Global is its Asian Avatar which deals with jobs in Middle-East, other parts of Asia and also expanding well towards Africa. So, if you are willing to be a part of the all expanding middle East, you can’t miss this one. This site is one of the most popular ones for the top Hotels in Dubai, Qatar and Saudi Arabia and is a rich source of Gulf hospitality jobs. This is a bonus one for Information Technology professionals of the hospitality industry. Skip this one if you are not looking for IT Jobs Positions in the hospitality industry. Predominantly a technology search portal based in the USA, Dice is one of the best hospitality job portals in making if it is related to technology in some way or the other. It is also expanding to other parts of the world. You can search by company, keyword, job title, employment type, company, and location. Register users are able to upload their resume, store resumes, and cover letters, get salary information and track jobs. There are a lot of other sites to look for your dream hospitality jobs. Have a look at a comprehensive list of Hospitality Job portals at Platohire. It is always good to have a mixed strategy while looking to search for hospitality jobs. Apply directly to hospitality establishments through their career sites, network socially, stay alert for local job listings and utilise the best hospitality jobs portals.